Fear of the unknown causes much distress in our lives. When things are out of our control, we often worry, feel stressed, and even become physically ill. Unfortunately life is not always as perfect as it appears on social media. People are hurting all around us. Those who are battered and bruised show visible signs of their pain. Others endure pain that we cannot perceive. Whether its physical or emotional pain, many are fighting battles of which we are unaware. The past two months have been difficult with much time spent in hospital waiting rooms. Our family has suffered grief during the passing of my grandmother and fear of the unknown after a fairly simple surgery for my uncle turned into something very complicated. During this time, we met other families who were also suffering. Some we learned specifics of their situations. I remember one particular lady in the Critical Care waiting room. During a brief encounter, I simply reached out, patted her arm, and told her I was praying for her family. She began to cry, thanked me, and then continued on her way. Those moments spent in a waiting room full of family members who were traveling down unfamiliar paths made me more mindful of the fact that we are all fighting a battle of which many are unaware. For each of those families, time seemed to stand still as they/we waited to pass through a rough place in our path. The joys of life were temporarily replaced by fear, darkness, questions, and doubt. Often when the way grows dark and we can’t see what lies ahead, it is easy to wonder where is God and why isn’t He working. We forget that He is always there. Isaiah 42:6 reminds us that He will smooth the rough places and will never desert us. 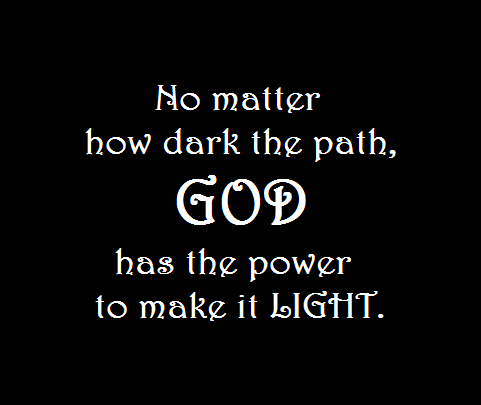 It doesn’t matter how dark or rough the road becomes, our Almighty God has the power to turn the darkness into light. Even in that darkest moment when things seem to be spiraling out of control and we possibly even doubt God’s presence we can trust that He is still there just as He promised! The secret is to turn our focus from the fear, worry, pain, anger, and stress and instead focus on seeking Him.